Hatshepsut's temple is located at the base of a dramatic cliff in the Valley of the Queens, across the Nile and about 6 km (3.6 mi) west of Karnak. 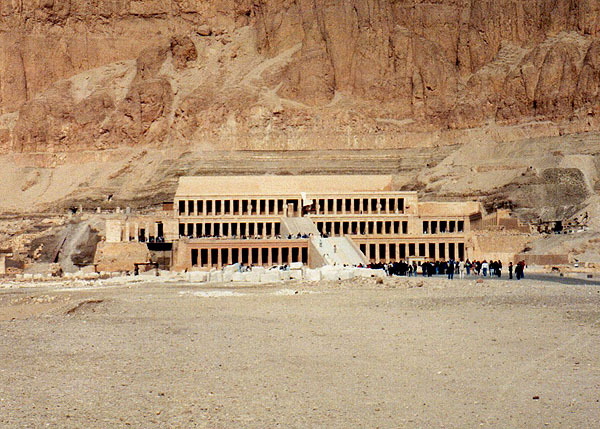 The temple is not physically connected to either of Hatshepsut's tombs, but served as the place of her mortuary cult and as the western terminus of the Beautiful Festival of the Valley, an annual procession in which the divine barque of Amun was carried across the Nile from Karnak to visit the Western necropolis. Temple reliefs celebrate the divine birth of Hatshepsut, the Expedition to Punt, and other events of her reign (1498-1483 BC). Credit for overseeing the construction of Hatshepsut's mortuary temple, in addition to her building activities at Luxor and Karnak, is officially given to her steward, Senenmut, in his title as Great Steward of Amun. It's not clear, however, to what extent he was personally involved in the design of the monument. The limestone temple is partly free-standing and partly cut into the cliff face behind it. Its design, inspired by the adjacent 11th Dynasty temple of Mentuhotep I (2060-2010 BC), consists of three terraced levels, connected by ramps, each level supporting a colonnaded portico. The temple faces east1; the photo, above, looks west. At photo left (south) are standing columns of a shrine to Hathor, and to the left of that are the remains of Mentuhotep's original temple. The complex also includes shrines to Amun, Anubis, and Re. 1. The temple actually faces southeast. However, the ancient Egyptians considered their temples to be symbolically aligned along the four cardinal directions, even when their actual alignment was not exact.